For the Europeans whose collective spirit shaped the Renaissance half a millennium ago, there was an acute sense – or so it seems in hindsight – of being at the intersection of two epochs, as old ways of thinking rapidly gave way to new insights, ambitions and dreams. This feeling of transition also had a geographical dimension: what had previously been the only world that people assumed existed was suddenly the Old World. And somewhere far to the west lay its unknown counterweight – a place of hidden mysteries that only became deeper and stranger as ships returned bearing unusual cargoes and extravagant tales embellished by sailors who’d glimpsed the other end of the Earth. This is the spirit we’ve set out to recapture in a unique new TravelQuest experience unfolding in the summer of 2016: The Age of Discovery. And there isn’t a more apt destination for evoking that visionary era than the Iberian Peninsula. To earlier generations of Europeans – other than a few Viking adventurers far to the north – the cliff-lined coasts of Portugal and Spain had marked the threshold of mythology, perhaps even the beginning of nothingness. Already isolated from the rest of the Continent (as Dumas later suggested, the peaks of the Pyrenées were in effect the beginning of Africa), Iberia’s renowned sailors and navigators sought their destiny by unfurling their sails and setting out in search of precious gold and silver, fragrant spices, exotic creatures and rumors of a true paradise on Earth, with treasures so profound they might include the secret of life itself. 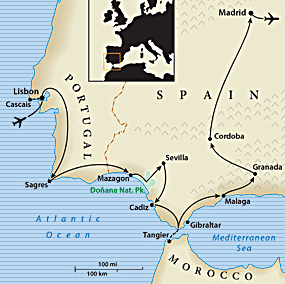 Led by Cesar Higueras – expert on Iberian history and culture, and TravelQuest guide extraordinaire – this unique 15-day journey will take you to less-known places and revisit familiar ones with new eyes. 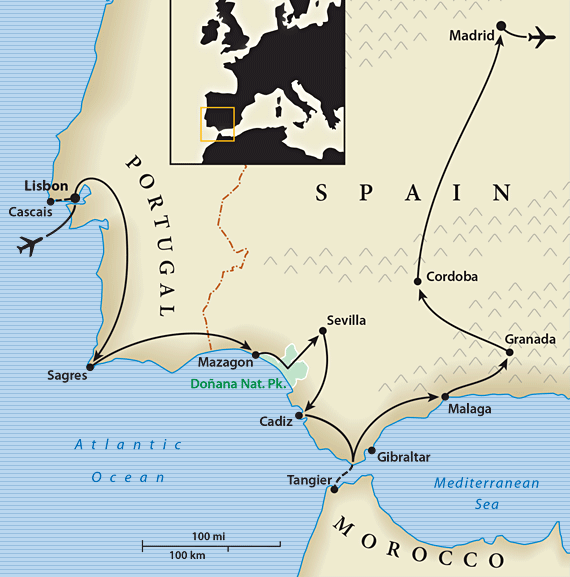 Along the way, you’ll enjoy the many facets of Portugal and Spain: spectacular coastlines, historic landmarks, superb wine and cuisine, and above all, the underlying spirit of curiosity and adventure that sparks our urge to travel and, like the great explorers before us, fuels the deeper journeys we make within ourselves.